The Google Camera app has only been in the Play Store for about 6 weeks, but it has already received a couple updates, but Google isn't slowing down. Another update is rolling out for the app right now and it brings a couple of features that users have been asking for since the day the Google Camera landed, including 16:9 widescreen shooting. The 16:9 widescreen shooting will mean that your photos will be auto-cropped, which can have an effect on the final resolution of your image depending on your hardware. The Nexus 5 will apparently max out at 6MP for 16:9 shots and get the full 8MP on 4:3 shots; however, that was reversed on the Moto X where we found that 16:9 maxed out at the full 10.5MP on the rear camera and 2.1MP on the front, but 4:3 shots will max out at 7.8MP on the back and 0.3 on the front. So, be sure to check in the settings to see what is best for your device. Another nice update is that the app will make it easier to find the settings menu by highlighting it the first time you pull out the navigation options from the left drawer. 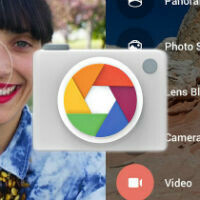 On the feature side, Google has also added in a timer which can be set for either 3 or 10 seconds, and there are new options for panorama photos -fisheye and wide angle - to go along with the horizontal and vertical panos. The update is rolling out now, but if you want to manually install it, you can grab the links at the source. It is large, buy I like it, it's hard to miss. Off topic but can anyone with a Verizon HTC M8 or S5 tell me if they have that persistent wifi notification that plagued the M7 and S3? Nothing of the like here, Verizon M8 & loving it! It would be nice if illustration 3 showed the phone in landscape orientation for taking photos and videos... Vertical videos are evil!! !